Hail Belgium! Long Live the Sprout! The new year is a perfect time to start a new “to-do list”, set new goals and lose the ten pounds you put on during the holidays – Yes, I’m talking to myself. When I stepped off the scale at the gym a few days back, I looked at Steve with my best “how did this happen” eyes and he, as any supportive husband would, said, “at least you had fun getting there.” Touché. So now I need to get back on the health train, curb my sugar addiction and lose some of that well-earned holiday weight. Note from husband Steve: I’m proofing this entry for my wife at 9:00 in the morning as she’s busy in the kitchen making home-made marshmallows and rice crispy treats for a frozen PB&J dessert – so she may be using the word ‘curbing’ loosely. I think we may be headed for a sugar intervention! I figured what better way to jump-start a healthy New Year than with everyone’s least favorite vegetable – the Brussels Sprout. 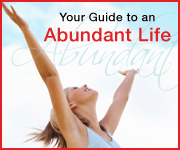 Before you close your browser, end your blog subscription and unbookmark cbandjblog.com forever, bear with me for a few more paragraphs and, you, too may be a sprout believer. You see, Steve and I both HATED Brussels Sprouts. The only fond memory I have of them as a child is my father hiding one under a pile of green beans like a land mine as a practical joke. The fact that I’m blogging about Brussels Sprouts probably has him beside himself right now. 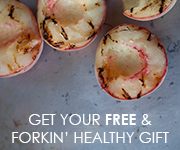 It was hard enough for him to watch me scarf down fresh pecans at Christmas – and now this! He’s probably wondering who this nut lovin’, sprout eating metro-hippy is and what she did with his daughter! It was about two years ago now that our good friends Mitch and Amy treated us to a superbly delicious dinner featuring an amazing cauliflower soup with truffle oil, a gorgeous whole fish with orange butter sauce that I wanted to lap off the plate and… Brussels Sprouts. In all honesty, I can’t say I was thrilled when I found out Brussels Sprouts were on the menu. But I will always try anything someone cooks for me – and with one bite I was a changed woman. 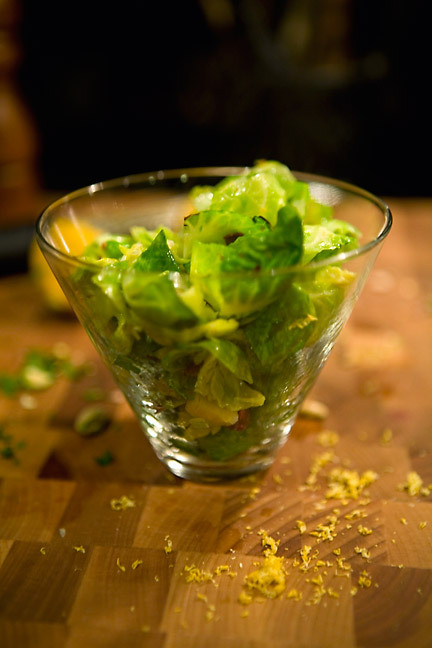 What Amy put in front of us was a large handful of crisp bright green leaves tossed with pistachios, lemon juice and salt. 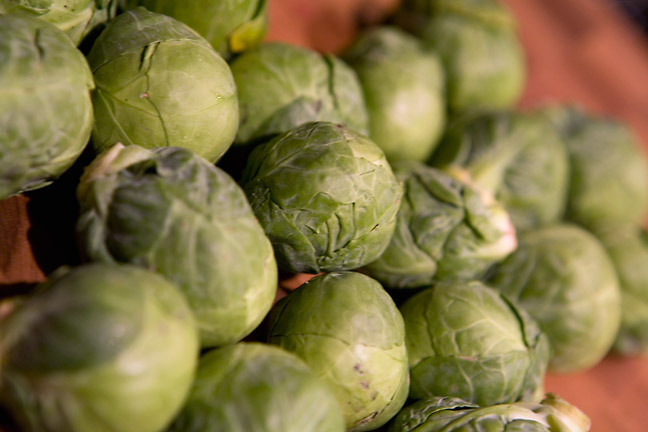 They were magnificently simple – bright, fresh and delicious (words I would have never used to describe Brussels Sprouts in the past). I have since converted many sprout haters with this delectable and healthy dish. Most of the work takes place during the prepping period. The Pistachios need to be shelled, unless you buy them that way, but I don’t think it’s worth the extra cost. Also, the leaves need to be shucked from the sprouts. Both of these jobs are perfect for kids, husbands and/or friends offering to help in the kitchen. About 7 minutes before you are ready to serve get your grape seed oil nice and hot in a wok or large sauté pan. You want to give yourself room to toss the leaves around. Grape Seed oil is very important here because it’s light, flavorless and can withstand high heat without smoking. We made the mistake of using olive oil once and the results were not nearly as good. 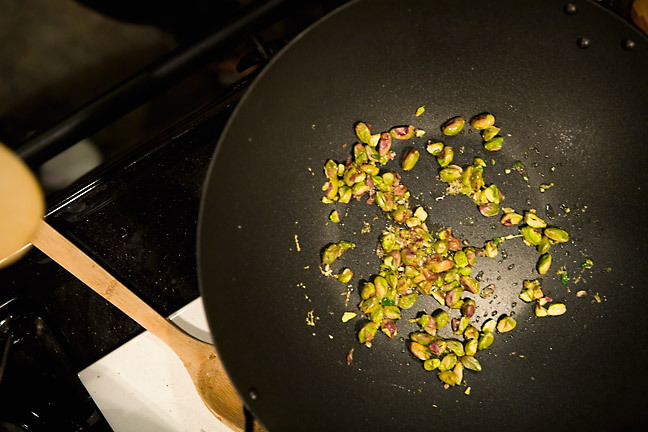 Once the oil is hot, add the pistachios and lemon zest and let them sizzle for about a minute before adding the sprout leaves. Now toss like you are tossing a salad. Don’t be shy, just get in there. After about 5 minutes you’ll have super bright, slightly crispy leaves. Remove from heat, douse with lemon juice and sea salt. Serve and watch your guest gobble them down like candy. • 12 large Brussels sprouts (about 1 1/2 pounds), trimmed, leaves separated from cores discarded. Cut the end off the sprout for easy access to the leaves, you may need to do that a couple of times to get all the leaves. Heat oil in large wok or nonstick skillet over medium-high heat. 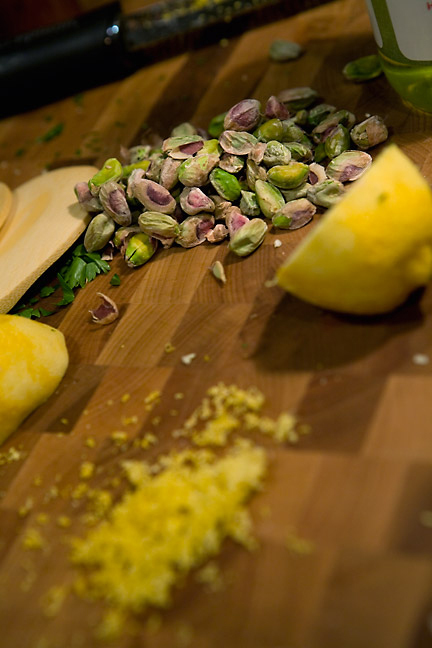 Add pistachios and lemon zest, and sauté for one minute or so. 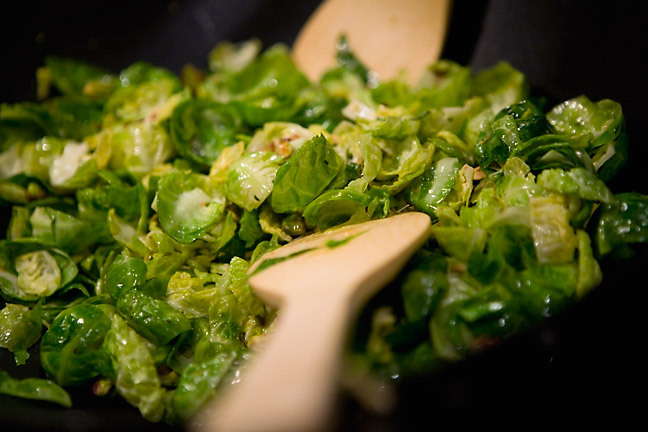 Add Brussels leaves and toss unit bright green but still crisp, about 3-5 minutes. Drizzle lemon juice over. Season to taste with sea salt. Serve immediately. 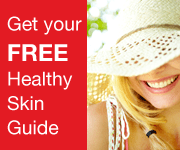 Notes: Grape Seed Oil can be purchased at Whole Foods and Fresh N Easy. I haven’t checked Trader Joe’s but I would imagine they would have it as well. One more thing: Check out my Flickr photos of a sunset at Solana Beach over New Year’s weekend. It was the most breathtaking sunset I have ever seen! This recipe was on my menu last week. 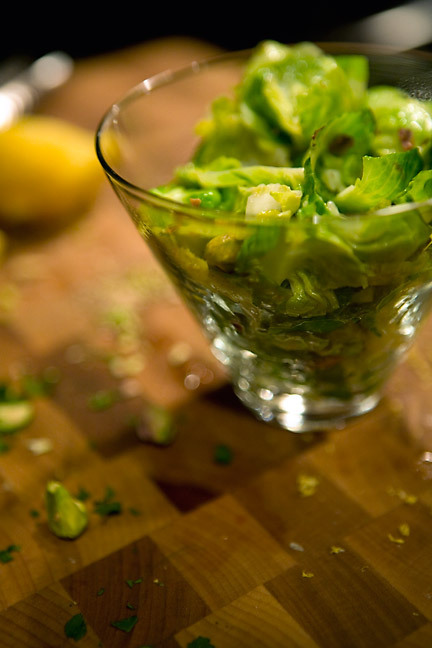 Best brussel sprout recipe I’ve tried by far! So glad you picked this one to post. It will definitely covert those brussel sprout haters!! That’s great!! I really hope people like it 🙂 How is veggie life going for you? This looks glorious. I already love brussels sprouts and am always looking for fun things to do with them. Nuts and brussel sprouts? it’s a total 180, but I like it! I will try out this daring recipe the next chance I get. ha ha! I know! I’m a new woman. You have seen Mark’s face at Christmas….priceless! i’m doin it tonight! wish me luck.. i will praise you if they are glorious! thanks so much im so pleasantly surprised with this recipe, and brussel sprouts are soo good for you! making the sweet potato enchiladas next week! you are so adorable!! We had sweet potato enchiladas tonight for dinner!